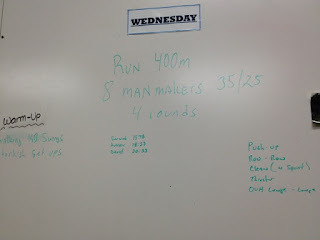 A manmaker is a push-up, row, row, squat clean, push press, lunge, lunge- takes forever! 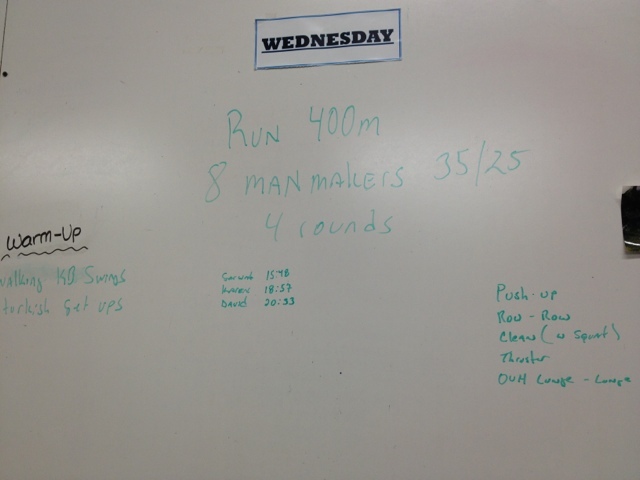 Before the WOD, we did a warmup of walking kettlebell swings and turkish getups. I used a 25 lb kettlebell and felt pretty good about my Turkish getups, so after the WOD was over, I tried the 35 lb kettlebell and was surprised how easy it felt to do the getup. One video of me doing the getup on my left (weaker) side, slightly unsteady but pretty good! Today was a good workout day!